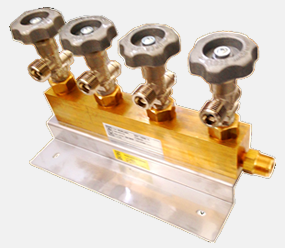 High pressure decompression board for shielding gases (Argon, Carbon dioxide, helium or blends). 4 inlets to connect cylinders. Heating system integrated (200 watt). It has been designed in order to satisfy any requirement like extreme low and high temperature, heavy duty resistance, precision of the regulation, avoiding the risk of freezing, reducing wastes and so on.